This unique lithograph is among the most striking portrayals ever created of USS Carl Vinson, named in honor of “The Father of Our Modern Navy,” Congressman Carl Vinson of Georgia. It commemorates and celebrates one of America’s most powerful and versatile miltary assetts and depicts the vessel in all its glory. It also includes notes and facts, such as the ship’s history and vital statistics. As one of the world’s most powerful, self-contained, combat platforms, USS Carl Vinson, with her nuclear power plant, stands ready to project her power anywhere in the world as directed by the policies of the United States. With enough fuel for 15 years of operations provided by her nuclear propulsion system, USS Carl Vinson (CVN-70) can remain longer, travel further and fly more missions than conventional powered carriers. Because of her ability to carry extra fuel (for her aircraft in tanks which otherwise would have been devoted to approximately 11 million barrels of ship’s fuel… and by maintaining her equipment and personnel in the highest state of professional readiness), Carl Vinson’s capacity to perform her wide variety of missions, in defense of our country’s national interest, is greatly extended. A high degree of Carl Vinson’s power resides in her embarked airwing which features a diversity of squadrons. Each aircraft in each squadron contributes to the success of the carrier’s missions. 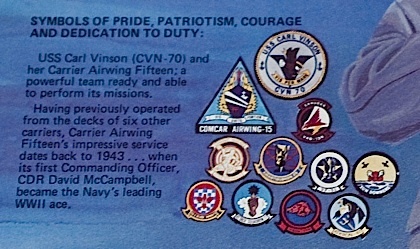 Aircraft presently assigned to Carl Vinson include: A-7E Corsairs II and A-6E Intruders, E-2C Haekeyes and F-14A Tomcats, S-3A Vikings and SH-3H Sea King Helicopters, plus EA-6B Prowlers. USS Carl Vinson (CVN-70) and her Carrier Airwing Fifteen; a powerful team ready and able to perform its missions. Having previously operated from the decks of six other carriers, Carrier Airwing Fifteen’s impressive service dates back to 1943… when its first Commanding Officer CDR David McCampbell, became the Navy’s leading WWII ace. This work was completed in 1985.